Tissue Paper - White - 20" x 15"
• Dimensions: 20" x 15"
I'm such a happy camper! Can't find this size for less anywhere! Shipping is fast, cost is excellent and so is the service! OK. compared to the type we usually get, we can see this tissue has a slight yellow tint to it. It is fine though, once our other tissue is gone, you won't see the difference. It's tissue and it served it purpose. The price was amazing, the shipment faster than Jimmy John's, and the paper is quality. It doesn't rip or crumble like many tissue paper accents. love the product, just right for my business!! This is a good size for smaller items, no waste. Good quality at the right price. These are just the right size. Great for adding a little touch for my packages. Perfect for bottom of gift bags! I purchased this same product from another wholesale supplier. By purchasing this order from Supply Store Warehouse I cut my costs by over 50%. I thought the price was a mistake when I first saw it. Have used the larger size but this works perfect for our smaller items. The quality is excellent. Fits nicely with the smaller bags. As always your service is excellent. We use these at our counter to wrap small breakables. Just the right size. Good price! 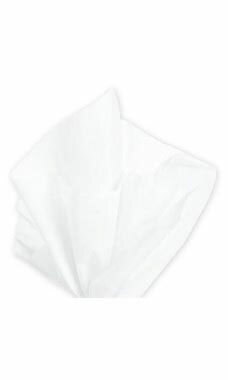 You cannot beat the quality or price on the tissue paper from Store Supply Warehouse! Love these half sheets of white tissue paper for wrapping small items. Excellent quality. I bought this item so I can wrap my customers jewelry neatly before bagging it. They are nice pieces that will keep the jewelry protected. I keep a pile at the register. Perfect size to fit in the checkout area! Perfect for my needs. Just basic tissue paper.